It’s not the thickness, but the centering of the bit across whatever that dimension is. So I’d say as long as the pieces are consistent in thickness it shouldn’t matter. I am not sure why you meed a lock miter bit for this. What would you recommend Carloz? Plain miters? First off, you don’t need a setup block. I just wrote a blog post yesterday that shows how to set up a lock miter bit easily by separating the bit height setup from the fence setup, so you’re not wrestling with two variables at once. Second, I don’t think this is a good place to use a lock miter joint. The reason is that the lock miter pattern will be visible from the top. Instead, I’d do a spline miter joint. Do a web search for information on how to cut them and how to make a jig to cut the slots for the splines. 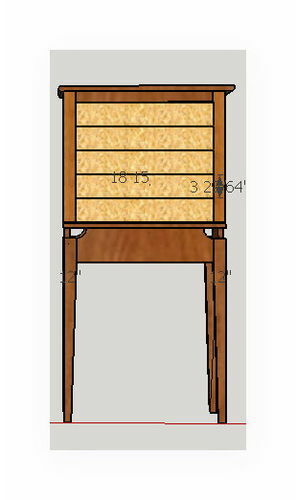 I thought about splined miters, but I don’t want the splines to show on the front as this is set to give the appearance of the legs continuing to the top. Below is a look at the entire piece. Keep in mind this is a design in progress and will be tweaked a lot more. The two doors for the referenced miters are left and right and will hole necklaces. I want the appearance, even though there is a space, that the legs invisibly connect. Its beautiful, but maybe above my skill level. Tough luck. Lock miter will not work in this case. You could try biscuits but I am afraid the whole construction is very flimsy. No joint on that narrow frame will give you satisfactory results especially thay you cannot glue the panel to the frame. Which triggers a question why do you need the frame at all? Just use a simple glued up top. Rout some grooves along the edge if you want the look. FWW a few months back had a technique for making stable frame/panel doors that lacked sufficient “beef” in the corners. Worth a look anyway. 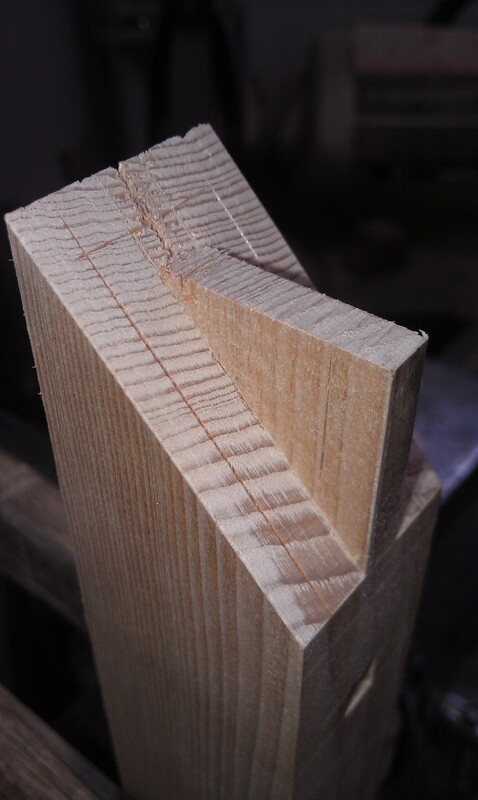 There always is the stub tenon, bridal joint and corner spline which can be made a decorative element. What’s the back made out of, Tim? If it’s wood, and glued into rabbets, no corner joint is going to hold. You’d need to be using plywood. Hi Rich. Yes plans were to rabbet 1/2” mesquite there. The end pieces will be 1.75” wide What are your thoughts on using a half blind dovetail to connect those pieces? Or could use pocket hole screws and no rabbet. Plywood is not an option on this piece. A solid panel of mesquite, or any wood for that matter, is going to expand and contract enough to destroy any joint you use if it’s glued in like that. Panels need to float in a groove, unglued, and I don’t see any way you’re going to do that without having gaps. 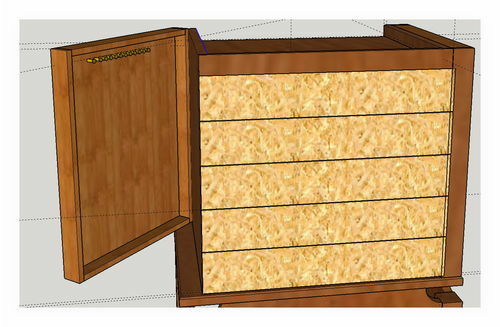 So would this work, I increase my width to 2”, have a floating 1/2” side panel, with groove inset 1/8-1/4” from the edge? And thanks all for the feedback, this is a great forum and I learn a lot. Yeah, it’s got to float. You can tack it with glue right in the center to hold it steady, but it needs to be able to expand and contract.